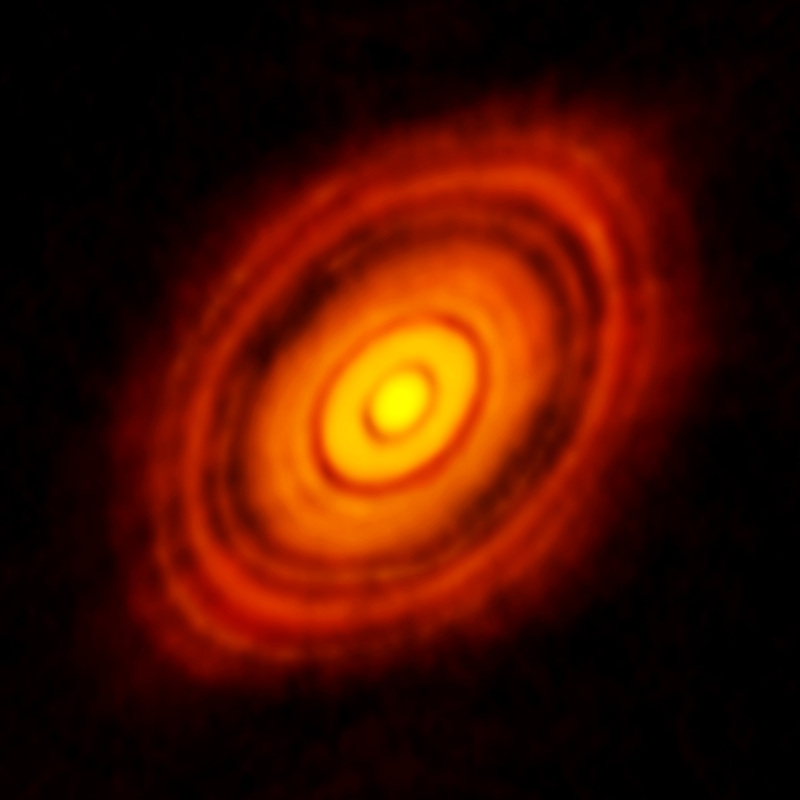 This incredible image released today by the ALMA Observatory, is our best ever view of the formation of planets. I think it deserves to sit alongside images like the Hubble Deep Field and the Cosmic Microwave Background as one of the classic astronomy photos. What we see here is the disc of gas and dust around a young star called HL Tau, about 450 light years away in our Milky Way galaxy. 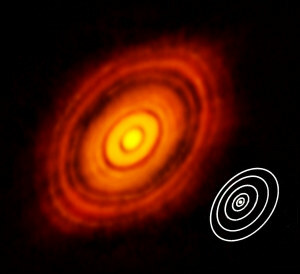 The dark rings are regions where the gas and dust has been swept clear by planets forming in the disc. Stars are believed to form from the collapse under its own weight of a cloud of gas and dust. As the cloud collapses, the star is formed in the centre, surrounded by a thin rotating disc. It is in this disc that dust particles stick together to form larger grains, the grains grow into pebbles, the pebbles into boulders, and eventually planet-sized bodies are made. These then sculpt the structure of the disc, creating rings and gaps as they sweep their orbits clear and influence the motion of the remaining material in the disc. What is quite surprising here is that this process is well under way despite the star only being about a million years old, still in the cradle in astronomical terms. We knew that something like this must be occurring in protoplanetary discs but there’s a big difference between having theoretical models and having the high-quality observations to test those theories. These revolutionary observations were made with ALMA, the Atacama Large Millimeter/submillimeter Array of telescopes high up in the Andes Mountains of Chile. ALMA comprises 66 telescopes linked together so that they work as one. To make this image, the telescopes were spread up to 15 km apart. The farther apart they are, the sharper the image you can make. 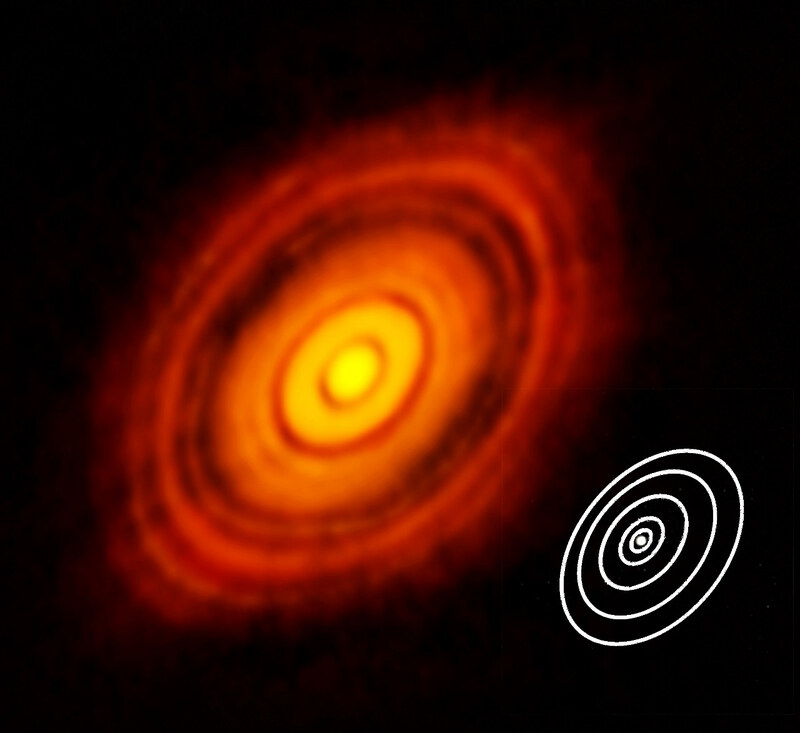 At mm wavelengths this means ALMA gives us a very detailed view of these forming planets, seeing details only 35 milliarcseconds across (about 50,000 times smaller than the size of the Moon on the sky). This detail is about the same as we achieve here at Jodrell Bank with our e-MERLIN array of telescopes working at centimetre wavelengths but with telescopes spread up to about 200 km apart. One of e-MERLIN’s own key legacy projects, PEBBLES – Planet Earth Building Blocks, also aims to study this process of growing planets from dust in the disc. The Jodrell Bank Centre for Astrophysics hosts the UK ALMA Regional Centre which provides support for UK scientists using the ALMA facility. For more information about these ALMA observations of HL Tau, read the ESO web page or the NRAO web page.